Are Hybrids the New Yield Force in Alfalfa? While the potential of hybridizing alfalfa has been demonstrated for many years, producing large quantities of seed has limited commercial development of hybrid alfalfa. Seed production economics prompted the search for less expensive ways to produce hybrid seed. In the spring of 2001, a new hybrid alfalfa variety (HybriForce-400) was released and sold on a commercial basis. If this and future alfalfa hybrids can contribute to forage yield like corn hybrids contributed to grain yields, then we have entered a new and exciting era. This paper will examine the concepts of breeding alfalfa hybrids and will look at current data on hybrid performance. Forage yield of alfalfa has increased during the time period from 1919 to the present, based on USDA data. However, the increase in yield has not been strictly linear. Yield trends remain flat until about 1955, and then increased steadily each year until the mid to late 1970’s after which yield gains stagnate. Early in the 20th century, yield gains of corn due to breeding were minimal. Until the 1930s, corn growers used primarily open pollinated corn, and the average yield at that time was about 20 bu/ac. Following the development and adoption of corn hybrids, grain yields increased steadily. Researchers report an average yield gain of 1-2 bu/ac per year for corn (Hallauer et al., 1988). Today average corn yields in the US top 130 bu/ac, and modern hybrids regularly yield in the 200-250 bu/ac range. Several researchers have reported on the contribution of breeding to alfalfa yield. These studies show that genetic yield gains of 0.15-0.3% per year have been obtained for alfalfa since the late 1950s (Hill et al., 1988; Holland and Bingham, 1994). A study by Loiselle (1992) indicates a 1% alfalfa yield gain per year for varieties release between 1977 and 1992. Analysis of alfalfa variety performance studies at Universities in the Midwestern US indicate that there is no evidence to conclude that alfalfa yields have changed during the last two decades (Wiersma et al., 1997). In fact, this analysis indicates a slight decline in yield during this time period. 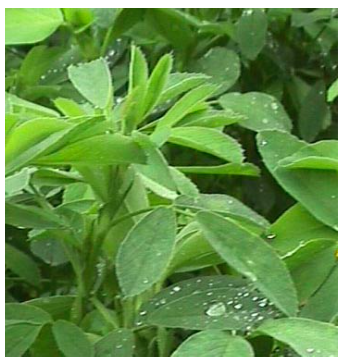 Most recent advances in alfalfa varieties have been a result of breeding for pest resistance. When pest resistant varieties are grown in environments where pest development is favorable, there is a marked difference between resistant and susceptible varieties. However, in the absence of pest pressure, resistant varieties do not improve yield over susceptible varieties. Overall, alfalfa genetic yield progress is very slow with accumulated yield gains of about 10–15% during the last 50 years. Like other species, the goal of breeding and selection of alfalfa for improved varieties involves a process of increasing the frequency of desirable genes in the population of plants. In cross-pollinated crops like corn and alfalfa, mass selection was the first type of genetic improvement undertaken. However, mass selection was not always effective in producing better varieties. Corn and alfalfa breeders began using other breeding methods for the development of new varieties. With corn, the development of vigorous inbred lines and the ease of pollen control (i.e., detasseling) led to the development of hybrids. In contrast, breeding of alfalfa is predominantly accomplished through recurrent phenotypic selection methods because of economic limitations associated with hybridization in this crop. Recurrent selection is the identification of individual plants with superior performance for a given trait or group of traits. Once identified, the superior plants are intermated to produce a new population, called F1 plants. The selection process then begins again on the improved population of plants. It usually takes 2–5 cycles of selection and reselection to exploit the genetic variability present in the population. Once a desirable population of plants is identified, plants are allowed to randomly intermate and seed is collected from the group of plants and identified as a synthetic variety. This seed is then used in the production of additional seed. Unlike a corn hybrid, each individual seed in a bag of alfalfa carries a unique set of genes. The population of plants grown from these seeds is then characterized for phenotypic traits such as disease resistance, flower color, or glandular hairs. The primary alfalfa breeding method is called recurrent phenotypic selection. This method involves choosing parents that are crossed to produce a synthetic variety. It is not a method of hybridization and does not take full advantage of the heterosis effect that occurs when two inferior parents are crossed to produce superior progeny. Like most agronomic species, alfalfa plants produce self-pollinated seed during normal flowering unless special steps are taken. Such steps often involve some sort of “male sterilization”, as in corn, for example, where the tassels are removed from the female parent plants to prevent self-fertilization. Since hybrids are the result of controlled pollinations, a system of making male plants nonfunctional is needed to achieve desired cross-pollination. Development of female plants (male sterile) that successfully cross with male plants results in a hybrid. The introduction of HybriForce-400 by Dairyland Seed Company utilizes a male sterility system of hybridization called msSUNSTRA™. In effect, selected male sterile (female) alfalfa plants are grown together with other male fertile plants and allowed to cross. The resulting seed from these plants (F1) is predominantly hybrid, although some seed will still be self-pollinated. Proper selection of alfalfa parents (male and female parents) is the key to making a successful hybrid variety. Because commercial hybrid seed is F1 seed, it is likely to be more vigorous than a commercial synthetic variety that has been through multiple cycles of crossing to increase seed quantity. In company advertising, Dairyland Seeds claims that HybriForce-400 has 8-15% greater yield over the life of the stand than non-hybrid alfalfa varieties. If this is true, it means that the breeders have made a large jump in alfalfa’s yield potential. Beginning in 1997, HybriForce-400 has been tested as an experimental variety (DS-9705) in various University variety performance trials. The seed used for these studies was produced in a research setting and did not come from large seed lots. Data for this summary were reported in the Central Alfalfa Improvement Conference (CAIC) Variety Test report during 1998-2000. Trials with HybriForce-400 were conducted in, Iowa, Michigan, Minnesota, Nebraska, Pennsylvania, and Wisconsin. In this summary, an environment is defined as the total yield from a single site in a single year. Most of the data is from the 2nd, 3rd, and 4th years of a trial, but two environments represent seeding year data. Data from these trials is summarized below and presented in Table 1 (right) and Figure 1 (below). In 24 test environments, HybriForce-400 yielded the same as or beat the trial mean, averaging 0.65 ton DM/acre higher. The yield of HybriForce-400 was significantly (95% confidence level) higher than Vernal in 21 environments. In 21 of 25 environments, the yield of HybriForce-400 was not statistically different than the average of the three highest yielding commercial non-hybrid varieties in each study. In three test environments, HybriForce-400 was significantly higher yielding than the best non-hybrid variety. In one environment, HybriForce-400 was significantly lower yielding than the best non-hybrid variety. 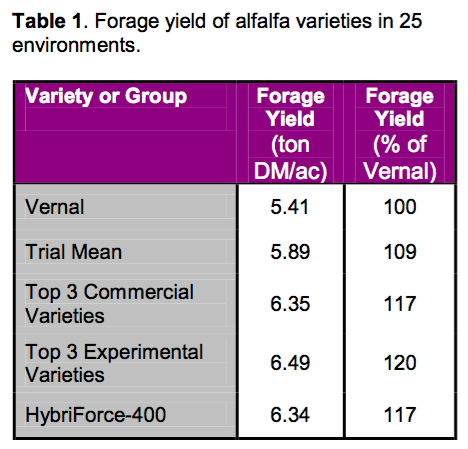 Compared to other experimental alfalfa varieties, HybriForce-400 was significantly lower than the best experimental varieties in three environments, but not different than the best experimental varieties in 22 environments. This preliminary evidence shows that HybriForce-400 is as high or higher yielding than currently available non-hybrid alfalfa varieties. However, there are commercial and experimental varieties that are capable of producing yields comparable to HybriForce-400. Company representatives indicate that field performance of the commercially produced seed has been visually better than the performance of alfalfa plots where research seed was used. They feel that this is attributed to better isolation and less outcrossing in a commercial seed field. 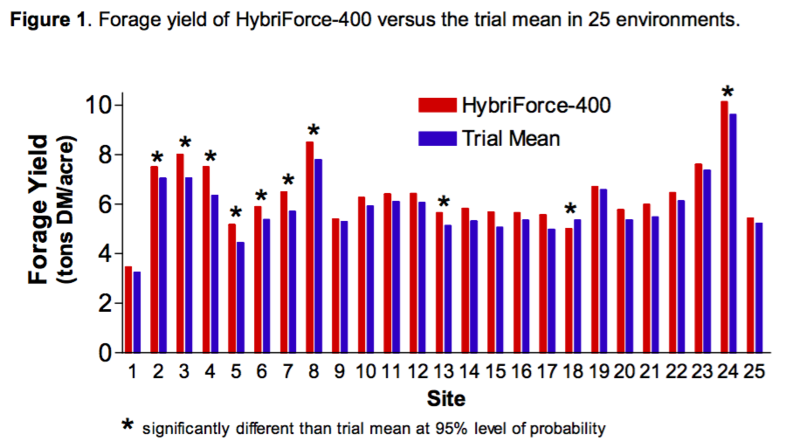 One feature of this data set is that HybriForce-400 consistently yields in the top 10% of each test environment. Forage crop researchers know that it is very difficult to find an alfalfa variety that will yield consistently in the top 10% of a trial in 25 environments. In this summary we compared HybriForce-400 to the average of the three top yielding varieties or experimental lines. Most of these varieties were different for each environment. The next most consistent variety had just four appearances in the top yield category. Selecting alfalfa varieties that consistently perform at a high yield level is a difficult task that requires many test environments to accomplish. Also, because varieties change frequently and yield differences are relatively small, there are often not enough test environments for an accurate evaluation of new varieties. Consistent ranking in the top 10% of each test environment indicates that HybriForce-400 is very stable and may have improved yield potential compared to other non-hybrid varieties on the market. Future advances in alfalfa hybrids may offer greater yield potential for this crop. Hill, R.R. Jr., J.S. Shenk, and R.F. Barnes. Breeding for alfalfa yield and quality. pp. 809-825 in A.A. Hanson, D.K. Barnes, and R.R. Hill, Jr. (ed.). Alfalfa and alfalfa improvement. 1988, No. 29 Agronomy, ASA, CSSA, SSSA, Madison, WI. Hallauer, A.R., W.A. Russell, and K.R. Lamkey. 1988. Corn Breeding. In Corn and Corn Improvement – Agronomy Monograph no. 18, 3rd edition. Amer. Soc. Agron., Madison, WI. Holland J.B. and E.T. Bingham. 1994. Genetic improvement for yield and fertility of alfalfa cultivars representing different eras of breeding. Crop Sci. 34:953-957. Loiselle, F. 1992. Alfalfa breeding in the USA – present and future. Lucerne Colloquium, Halle, 12-13th March 1992, Martin Luther University Halle, Germany. Wiersma, D.W., D.J. Undersander, J.G. Lauer, and C.R. Grau. 1997. Lack of alfalfa yield progress in the Midwest. In Proc. 25th Central Alfalfa Improv. Conf., La Crosse, WI.